The appearance of an error code in the washing machine during the washing process or at the finish is not good. It causes the user’s unpleasant feelings and misunderstanding of what has happened. But do not worry, because any problem is solvable. This can happen, for example, if an E18 error occurs in the washing machine manufactured by Bosch. Speaking of the Bosch technique instruction, the error is explained short and understandable. The E18 code that appears in the Bosch washing machine means that there is no drainage of water. And a user also notices that there is water in the tank. It seems like the appliance hasn’t even tried to start the drain. In various Bosch washing machines models, a manufacturer shows the error by different codes. F18 and d02 faults are the identical ones. “brain glitches” of the washing machine, module malfunction. If such an error occurs, the first thing a user should do is to close the water supply. Next, turn off the washing machine first with the button, and then from the mains. To carry out repairs and find the cause, you must also drain water from the tank. Do it through a small drain hose. It is located at the bottom of the appliance, next to the drain filter behind a small plastic door. The second way to drain the water is to pull out the drain filter. But in this case, it is necessary to leave some rags on the floor or put a basin under the washing machine. Unscrewing the filter, at the same time you may check if it is the cause of the drain system clogging. If dirt, foreign objects, and hair have accumulated there, clean and rinse the part. Also, examine the drain hose for bending. However, it happens seldom, but even so, you need to check it, too. if there is no debris in the branch pipes, then the cause of this error is not blockages, but something more serious. We’ll tell about this further. So, the washing machine is dismantled, the drain pump is almost in your hands. Pull it out and detach from the helix by opening the latches. 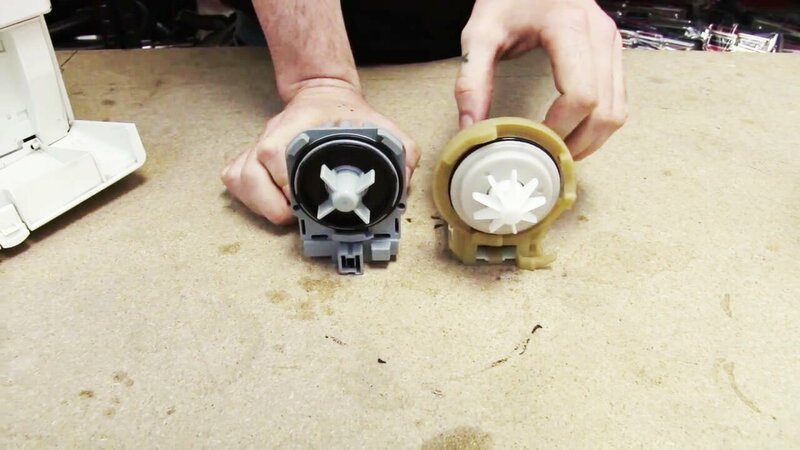 Having removed the helix, you will see a rotating part of the pump, the impeller. You may see villi or hair that has wounded on the detail. It prevents free rotation. As the result, the pump does not work and plum is difficult. assemble the washing machine and check how it operates. If the drain system is in order, then the reason for the lack of drainage is in other units of a technology. 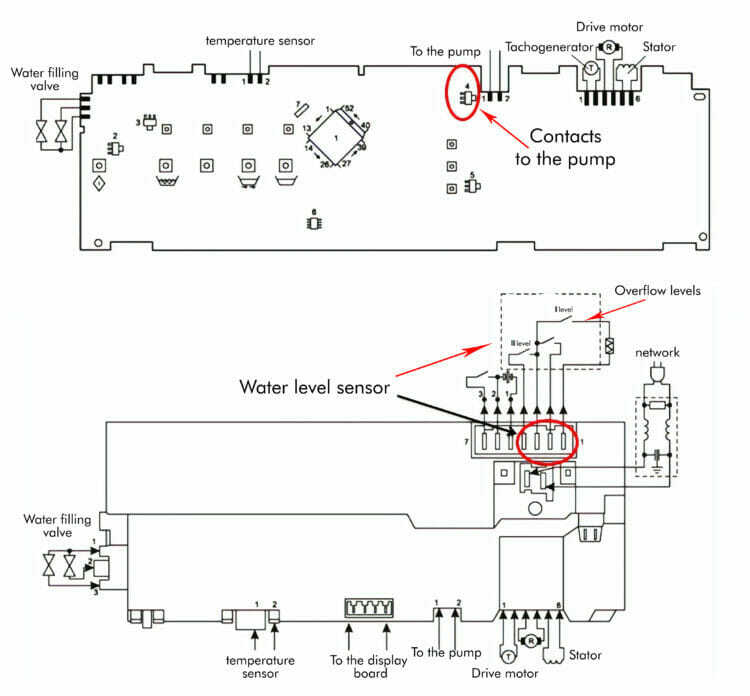 Besides the pump, the draining process depends on the sensor functioning. It measures the water level. If the sensor is broken, then the device can “hang” with a full tank, so prepare the multimeter. Pressostat in the Bosch washing machine is located in the right upper part of the case. Remove the top cover to access it. 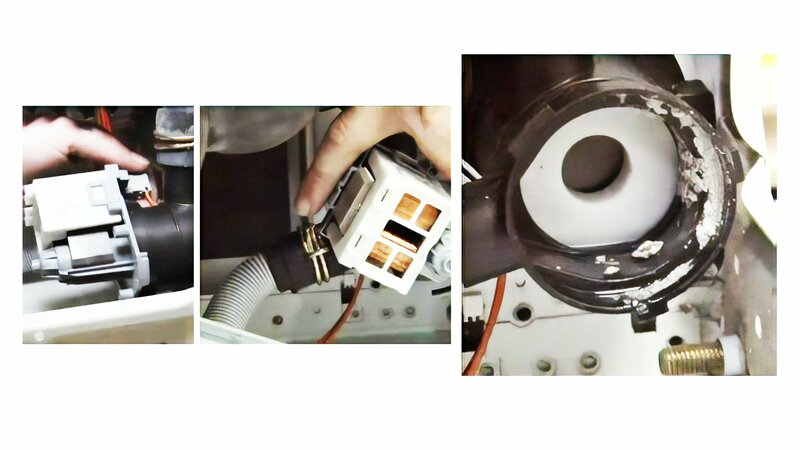 Before pulling out the part, check the integrity of the tube, coming from the sensor. Also, inspect the contacts of the wires connected to the pressure switch. Only after this, you can check the sensor and replace it if necessary. Breakage of this part of the washing machine can cause the appearance of any mistake. This is because the element is responsible for the operation of the whole technique. There are many radio elements in the control module the damage of which causes the appliance to stop. As an example, there is the universal module on Bosch washing machines of MAXX4 / 5/6 series. According to specialists, this detail can be fixed. So if you do not know the nuances of the work, entrust repair work to a specialist. Otherwise, you will have to change the part completely. By the way, it costs about a third of the washing machine price. So, in the case of this error, it is necessary to check the contacts of the pressure switch and the pump connection. In the scheme below we marked it red. If any of the elements fail, you should replace the broken unit or solder it to a new one. So, if Bosch washing machine stops full of water and issues the e18 error code, do not panic. It is possible that you can solve the problem yourself.